"I guess Eric isn't such a sadistic guide, after all." "He certainly is very good-looking," Di sighed. "You would think so," said Mart jealously. Pointing to his short blond hair, he muttered to Brian and Jim, "Maybe I should grow wild curls myself. They seem to drive the ladies mad." "Don't you dare!" cried Di. "We like you just the way you are. You're a real individual, Mart." "Good-bye, wild curls - hello, Di," Mart said happily. Sleepyside, New York and Groverville, Vermont. When the Bob-Whites struggle to find money to pay for their car insurance, Mr Wheeler offers them a job investigating a ski lodge he is considering buying. They take this job seriously but also get caught up in some strange occurrences at the lodge. Everyone becomes a suspect as they try to find out who wants them off Mead's Mountain and the mystery behind the strange white-haired man in the mountain. Bert Mitchell and Jack Cardiff - they force Stevenson to make counterfeit money by kidnapping his daughter. Bert planned to double cross Jack. It's strange to have another counterfeiting plot so soon after #20 The Mystery Off Old Telegraph Road. There is an immediate link with past books of this author when Mr Wheeler mentions George Kimball, a character in #13 The Mystery on Cobbett's Island. It's ironic that the Bob-Whites had no problems accepting a car from the Wheeler's, but they won't accept a loan or a gift of money to pay their car insurance. This is another trip Dan can't go on - 'he promised Judge Harding he'd spend vacation working with young kids from the juvenile home' (p. 25). 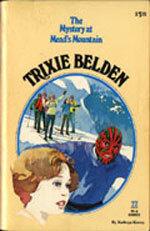 Trixie tells Bob that she can't drive, but in an earlier book she says that she practices on her driveway (p. 31). Their beige volkswagen is christened the Tan Van by Mart and Di (p. 30). Di claims that she's interested in art (p. 60) and later tells Jim that she wants to major in art at college (p. 142). She is currently taking art and has to have 25 good sketches for art class ready by the end of semester. Honey manages to lose her good gold watch again, after losing it in #8 The Black Jacket Mystery (p. 70). Di's art knowledge and her parent's connections come in handy when she solves the mystery of the white-haired man. He is the hermit artist, Carl Stevenson. Trixie demonstrates a handy skill. She can unlock a door with a plastic card (p. 165-66). "Are you three alright?" Miss Trask asks after Trixie, Honey and Jim walk in - Jim has a cut on his forehead, a badly bruised eye and a puffy face! (p. 198).